Gonzalo Cosa was born in Cordoba, Argentina on September 21, 1973. He studied at the Universidad Nacional de Rio Cuarto, Argentina, where he received his Licenciate in Chemistry degree in 1996. He was at the time the recipient of the Asociación Química Argentina Award. In mid 1997 Gonzalo Cosa ventured north, to Canada, to pursue a Ph.D. degree under the direction of Prof. J.C. (Tito) Scaiano at the University of Ottawa. His Ph.D. work in Physical Organic and Photochemistry involved mechanistic studies on drug photodegradation. He completed graduate studies in the winter of 2002. For his graduate studies Gonzalo Cosa was recognized with the Governor General's Gold Medal Award and was a recipient of the 2003 International Union of Pure and Applied Chemistry Award to the Best Ph.D. Thesis in the Chemical Sciences. 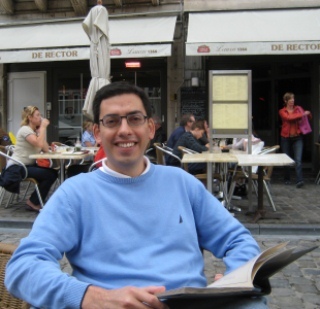 After graduate school Gonzalo Cosa headed south and he joined the group of Prof. Paul F. Barbara at the University of Texas at Austin. As a postdoctoral fellow in Paul Barbara's research group Gonzalo Cosa worked on Single Molecule Fluorescence Studies. He obtained the first time-resolved SM-FRET measurements on HIV-1 transactivation response (TAR) DNA hairpins and hairpin mutants complexed with HIV-1 nucleocapsid proteins (NC). In 2005 he returned to Canada where he joined the Department of Chemistry at McGill University as an Assistant Professor. He was promoted to Associate Professor in 2011, and to Professor in 2016. His current research centers in designing, preparing and utilizing smart fluorescent probes for cell-imaging and on applying state-of-the-art single-molecule fluorescence methodologies to study protein/DNA/lipid interactions. 2005Canada Foundation for Innovation, New Opportunities Fund Award. 1999 & 2001OCCI Poster Award, Ottawa-Carleton Chemistry Institute, Ottawa, Canada. 1997Asociación Química Argentina (AQA) Award to the Highest Graduating G.P.A. in Chemistry at the Univ. Nac. de Río Cuarto, Argentina.